Today, two security researchers have claimed to have discovered that the iPhones and 3G-equipped iPads regularly record and store location information to a hidden file that is backed up to iTunes and is even transferred to new devices! The researchers said that although this information isn’t necessarily accessible to remote hackers, the file raises important concerns over privacy. Warden was key in developing software to view and analyze the database of locations stored by your iOS device. A copy of that file is actually unencrypted on a user’s computer and is synced to your iPhone or the iPad. The researchers said that users can turn on backup encryption as a way to protect the information from leaking to anyone with physical access of your device. Apple was contacted in regards to this new finding but no statement of comments were issued. However privacy advocates were calling out Apple for abusing user trust. Privacy advocates said that iPhone users have great deal of trust in Apple and Apple has a responsibility of not to abuse that trust. 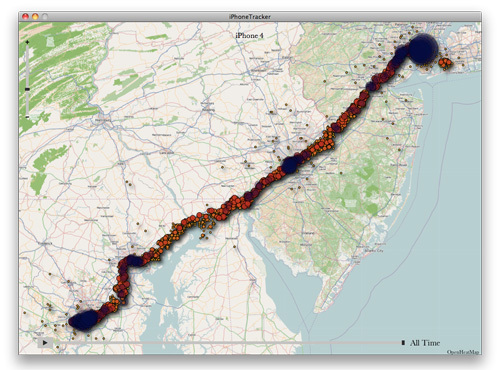 The iPhone tracker application developed by the researchers can be downloaded from here. Previous September Launch for iPhone 5? Next Nook Color to become the Best Value Tablet!